Silver Metallic Plastic Forks 24ct. Silver Metallic Plastic Teaspoons 24ct. Silver Metallic Plastic Souppoons 24ct. Silver Metallic Plastic Knives 24ct. SPECIAL!! 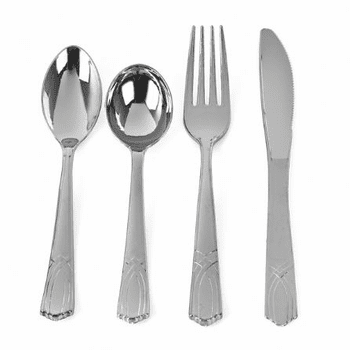 Silver Metallic Plastic Forks 600 Ct.
Silver Metallic Plastic Soup Spoons -600 Ct.
Silver Metallic Plastic Knives 600 Ct.